There are number of studies in developing countries which are connecting aquaculture production and poverty reduction. However, only few of them have been conducted to investigate the relationship between aquaculture and poverty though three indicators namely, percentage of poor people, poverty gap and poverty severity. 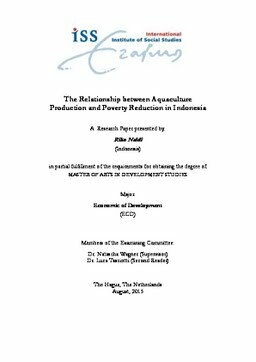 This paper aims to answer a question regarding relationship between aquaculture production and poverty reduction in Indonesia. Specifically, the paper is intended to analyse how big the impact of aquaculture production to reduce poverty in Indonesia through three indicators of poverty, namely, percentage of poor people, poverty gap and poverty severity. In term of methodology, the research applies fixed effect and random effect model to estimate the relationship between of them. Results show that aquaculture production has positive impact in reducing poverty based on three indicators of poverty namely, percentage of poor people, poverty gap and poverty severity. However, power of this sector seems to be weak. By comparing provincial level results and districts and municipalities results, increasing in aquaculture production is only stronger in level of provinces. Taking the coefficient of the production to each poverty indicators, this sector affects reducing poverty in percentage of poor people and poverty gap in provincial level. Meanwhile, the production only affects poverty at percentage of poor people in districts and municipalities level.